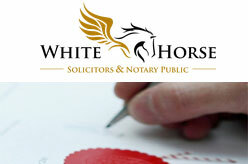 White Horse Solicitors & Notary Public. Cheap and Reliable NO VAT. £50 same day Notary and Apostille. This firm is authorised and regulated by the Solicitors Regulation Authority and regulated by the Master of Faculties Office of the Archbishop of Canterbury in relation to Notarial Practice. Registered in England under Company Number 08823734. Change of name documents, Deed Polls etc. Page last updated : 13th October, 2015.